Cancer pagurus or edible crab. : Image David RobertsCoastlines and estuaries are already challenging places for marine organisms to live. The physical properties of seawater – salinity, temperature, pH and oxygen levels – vary frequently. And with further environmental fluctuations due to climate change, they are becoming even more demanding. Patterns of sea surface salinity are changing, as fresh water input increases, due to exceptional storm events and runoff from flooding. Scientists have started to examine the combined effects of global warming and a reduction in seawater pH – otherwise known as ocean acidification – on marine communities. To date, it has appeared that multiple factors have more of an effect on these creatures than each factor in isolation. Together they influence the ability of species to compensate and survive the changes. However, not much is known about the combined effects of ocean acidification and seawater dilution on these organisms. This is important as changes in salinity tolerance are known to influence distribution patterns of marine species and their community structures. For our newly published study we decided to look at this combination of factors by focusing on two species of marine crabs: the edible crab (Cancer pagurus) and the shore crab (Carcinus maenas). Both are common to UK waters, but experience different degrees of environmental variation in their natural habitats. For edible crabs, home is typically the low intertidal shallow shelf waters for juveniles, and down to 100 metres for adults away from the influence of freshwater. While shore crabs typically live in estuaries and experience dilute seawater on a regular basis. We studied how the crabs reacted to what are predicted to be the business as usual levels of CO₂ in 2100 (1,000 micro-atmospheres) and a biologically relevant reduction in seawater salinity. We were interested to see whether the edible crab will be less capable than the shore crab which regularly experiences salinity variations. We were also keen to find out why one species is likely to be more vulnerable than the other by investigating the ways they naturally compensate for environmental changes. We exposed juveniles of both species to the different CO₂ and salinity conditions for up to one year. 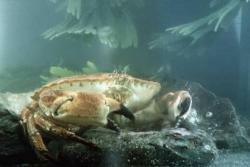 The crabs were fed regularly and they continued to grow by moulting throughout the exposure time. We found that the shore crab was fully capable of surviving the conditions for up to a year, but the edible crab struggled. The shore crab – which is a widely invasive species in countries outside Europe – increased its response to a stimulus (upregulated) its capacity to exchange bicarbonate ions across the gills. This mechanism helps buffer changes in body fluid pH associated with increased CO₂ in seawater. The edible crab, meanwhile, showed no such upregulation, and had limited ion transporting capacities. Instead, this species accumulated CO₂ within its haemolymph (crustacean blood) supply. There was some attempt at compensating for the conditions, but remarkably the edible crabs were better off in dilute seawater. This was a surprise as the edible crab typically spends all of its adult life living in marine environments separated from the influence of freshwater. The reason behind it is difficult to explain, but it may come down to passive changes associated with exposure to dilute seawater making the haemolymph more alkaline. Our work demonstrates that the juvenile edible crabs could survive elevated CO₂ conditions by moving into freshening seawater – but only for limited periods. This species also proved to be vulnerable to longer term exposures to dilute seawater. Our study helps us appreciate that there are fundamental differences in the biological capacities of marine species to compensate for climate change. 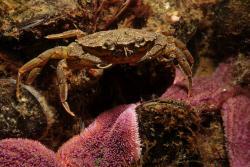 Even within a taxa of crustaceans that is generally regarded as being relatively tolerant to change. Fully marine species, such as the edible crab, with its preference for stability, are poorly equipped for survival in a variable natural environment. They are likely be to more vulnerable to climate change and further studies on this and similar species are urgently needed.